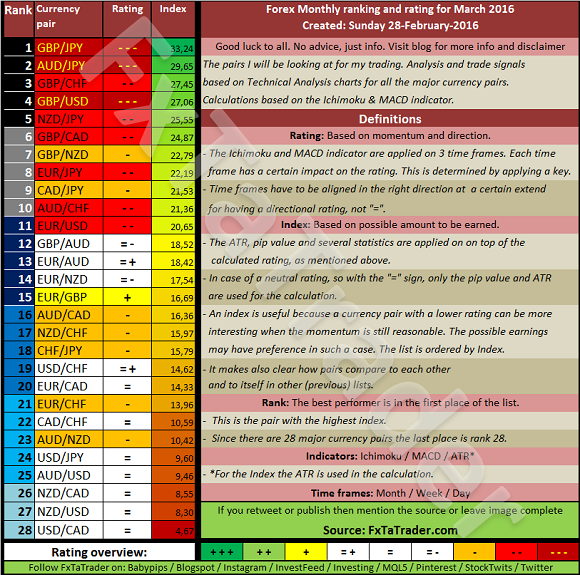 This is the article "Forex Ranking and Rating list" for the coming month, the article "Currency Score" will also be published this week. In the coming period only the article "Ranking & Ratig List" will be published. At the moment the process for generating the articles is being optimized and streamlined. The expectation is to publish all the articles again somewhere in February. Thanks for your understanding. When looking at the Top 10 in the Monthly Ranking and Rating list we can see that for the coming month the following stronger currencies are well represented for going long: USD(5X) followed by the JPY(2X) and the EUR(2X). The weaker currencies are the CAD(3X) with by the GBP(3X) followed by the NZD(2X).